See how much you can save with Spread it & Forget it. 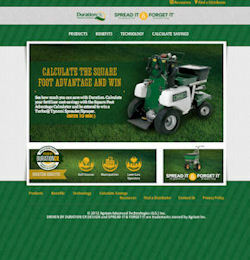 Calculate your fertilizer cost savings with the Square Foot Advantage Calculator and qualify to win a Turfco T3000i Spreader/Sprayer. Begin by visiting the Driven By Duration website. An easy-to-use calculator will take you through the steps to compare the total cost-in-use of what you’re currently using to a single application of Spread it & Forget it. For a more in-depth comparison, contact your distributor and proceed through the calculations together. Either way, you’ll be qualified to win a Turfco T3000i Spreader/Sprayer. Don’t wait too long, though, because your chance to win ends Jan. 31, 2013.